In a time when the federal government remains in a stalemate over immigration, the City of San Diego is creating a strategic plan to better integrate immigrants and refugees. There are many ways to do so, including creating a more inclusive city through education initiatives and culturally competent policies. The Mayor’s Office, in partnership with the San Diego Regional Chamber of Commerce and several other organizations, won a grant last year to create a long-term blueprint. 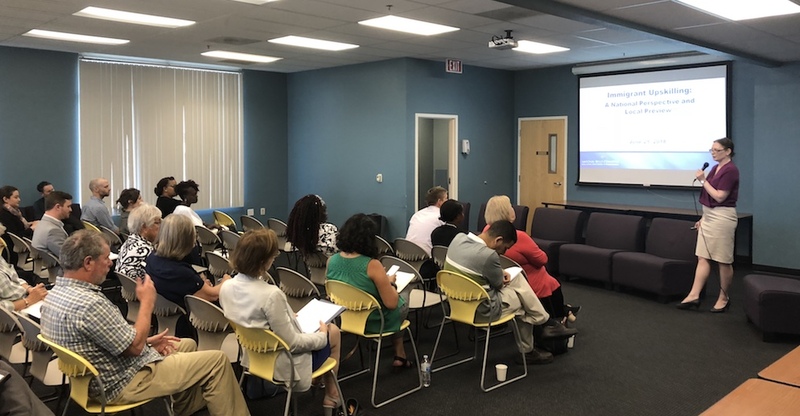 On Thursday, June 21, the San Diego Workforce Partnership and Welcoming San Diego partnered to talk about the essential role immigrants play in San Diego’s labor market, making up 1 in every 4 workers in the region. Amanda Bergson-Shilcock, Director of Upskilling Policy at National Skills Coalition, led the conversation with a keynote presentation, where she discussed national trends and local policies and practices that will allow immigrants and refugees to participate in closing the middle-skill gap and advancing economic outcomes. Among college-educated immigrants in San Diego, 30,000 are underemployed, which is 28 % higher than their non-immigrant counterparts. While some college-educated immigrants are being passed over, there are also immigrants who are undereducated. Bergson-Shilcock shared that in San Diego, 212,000 immigrants who are 25 years of age and older lack a high school diploma. Many are very hungry for skill building programs and jobs that will allow them to gain the necessary experience to continue to contribute to the local economy. Part of being an inclusive city is implementing policies and programs in an intentional and cross-sectoral way. For example, Seattle is using CDBG spending to start a Ready to Work program that serves low-level English learners. Boston is funding local nonprofits to serve low-income Latinos who have migrated as part of their Office of Workforce Development’s new economic mobility priority. As part of a binational mega-region with a constant flow of newcomers who are bringing skills, determination and culture, San Diego has the opportunity to implement these types of policies and include immigrants in the strategic planning and economic development processes. Another suggestion offered by National Skills Coalition is drawing on municipal and state immigration offices for leadership and air traffic control and collaborating with immigrant-serving organizations on the best way to serve new Americans. This is an important conversation that will continue to be facilitated by Welcoming San Diego. As the City of San Diego helps immigrants and refugees succeed in their new home, it will allow the region to continue to flourish and will positively impact economic development.